Environmental Lights announced the launch of the new HyperFlex 2835 LED Strip Light. HyperFlex LED Strip Light is a versatile tape light that allows you to make tight turns on flat surfaces. This strip’s circuit board features a unique design that allows it to bend, twist and turn in ways that regular LED strip lights cannot. HyperFlex LED Strip Light is designed and optimized for installations that have tight turns and contours. 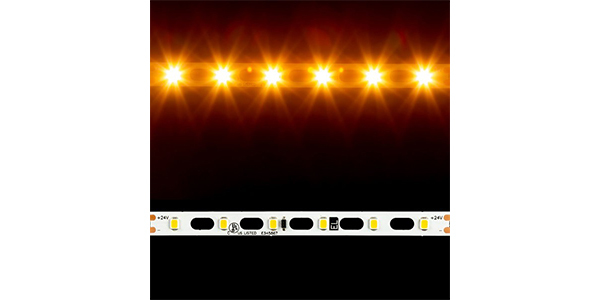 It virtually eliminates the need to cut and reconnect the strip light when needing to turn corners or make arcs in your lighting run. The HyperFlex 2835 LED Strip Light is 8 mm wide, features 60 LEDs per meter and comes in 10-meter reels. The strip is UL Listed and makes use of CurrentControl IC chips to ensure there are no noticeable effects of voltage drop on runs up to 10 meters.